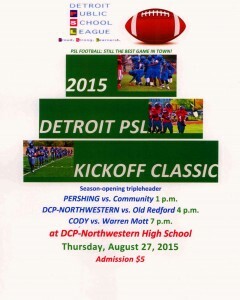 The Detroit Public School League hosted the 1st Annual Football Kickoff Classic at DCP-Northwestern High School. This event has been long overdue and allows the league to showcase teams not accustomed to being on the main stage. The league has done some realigning with the divisions to balance the power structure and increase the competitiveness of the league. Any football fan in the city knows the powerhouse teams usually cycle between Cass Tech, East English Village and King, but the talent pool in the PSL extends far beyond those teams. Allowing other teams to be featured in this type of event lets them know they aren’t forgotten and showcases their talents to a fan-base they wouldn’t normally play in front of. The Kickoff Classic has the potential of being an excellent way to showcase the entire league to that state and even the nation. This years slate of games did not disappoint at all. In a game dominated by big plays and big hits Pershing imposed their will on Detroit Community with game changing plays on offense and defense. Offensively, they were led by RB Omar Twilley who racked up over 200 rushing yards and finished with 4 touchdowns including a 90 yard TD run late. The Pershing defense made big play after big play and kept the shutout in tact after playing football the “Pershing” way winning 41-0. The Pershing coaching staff was satisfied with the win, but not necessarily with the effort. This match up between perennial state playoff qualifiers proved to be just that. Warren Mott scored a TD on a long bomb to Tylen Redding on the first play of the game in what appeared to be a major communication on the Cody D. The remaining of the first-half consisted of the two teams feeling each other out to the tune of multiple flags and raw emotions vividly displayed by players. Cody had multiple long drives stalled before they could cross the goal line. A late Cody turnover lead to a last second field goal and Mott lead 9-0 at the half. Warren Mott scored on the first drive of the 2nd half and that’s when the fun began. Cody answered with a score by Rodney Grimes who finished with two touchdowns and another called back for holding. Cody finally was able to get the passing game going and was able to move the ball, but too many interceptions and mental lapses cost them at the end. The effort both teams put up in the 4th quarter left attendees wanting more, Warren Mott went on to win 36-20. The citizens of Detroit and surrounding areas were treated to an amazing display this evening and should be hungry for more of the same this time next year.